I just bought a house and replaced the fan in the master bedroom. In the box in the ceiling there were separate power lines (black and red) to feed to the light and fan lines (black and blue) to control them separately. However, only one of the light switches on the wall works to control the light within the fan. When I opened up the box to look at the wiring set up, I can't figure out what is going on. I did my best to capture it in the attached wiring diagram. Only the switch on the left currently seems to do anything. Both switches appear to be single pole single throw switches (they are labeled off and on). 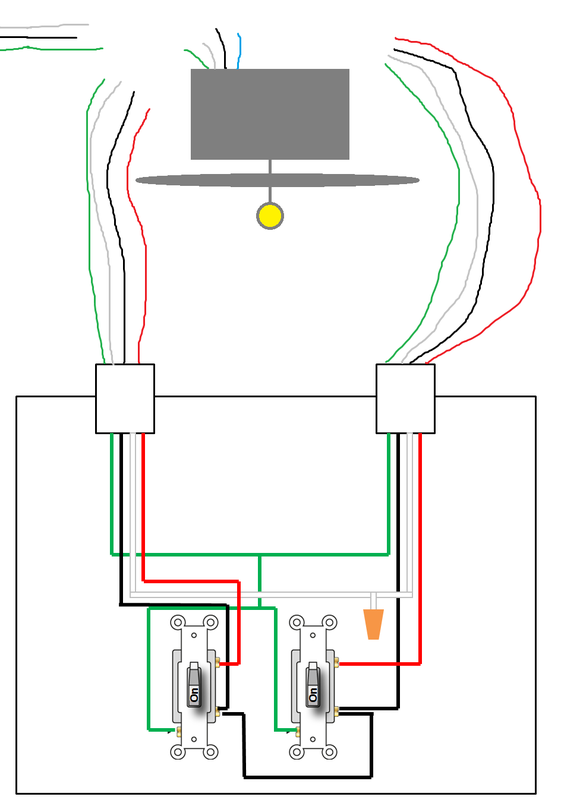 There are two three-cable wires in the light switch source box (black, red, white and a green ground wire). The neutrals are connected and capped. The black wires are each fed separately into the back of each light switch, and there is a black pigtail connecting the two light switches together (the bottom screw of one light switch is connected to the bottom screw of the other light switch with the pigtail). 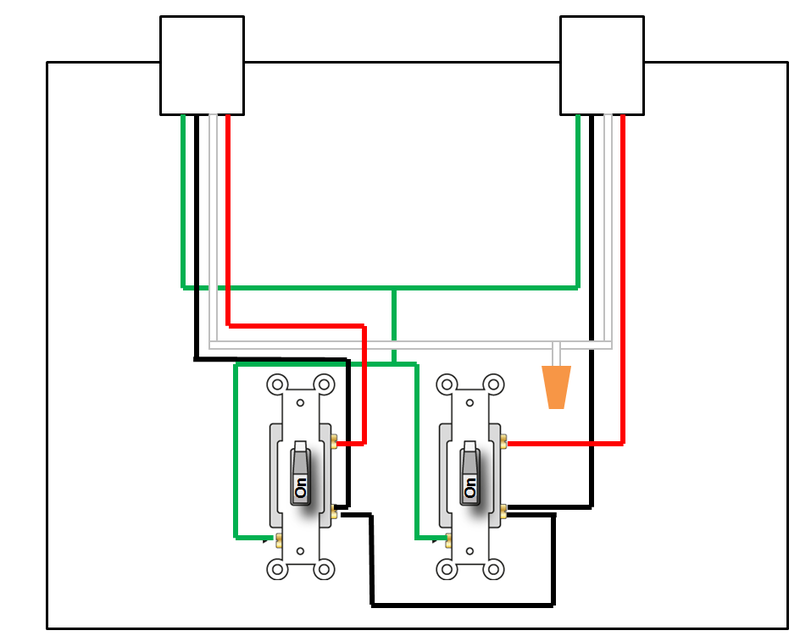 One of the red wires is fed to the top screw of the left light switch, and the other red source wire is fed to the top screw on the right light switch. There have been a number of switches in the house that were wired wrong (two-way feeding into three-way, etc.) so it wouldn't surprise me if this is wrong too, I just haven't been able to figure out what is happening with this circuit. Any ideas on how to diagnose the problem (right switch doesn't work) and re-wire would be appreciated. EDIT: The wiring in the ceiling is pretty simple -- black, red, white and green ground from source and black (for fan), blue (for light), white and green from the fan. I also have a remote for the fan wired in. If you want to see a diagram, I followed the "alternatively" diagram in this post exactly: How should I wire a ceiling fan remote where two switches are used to control the fixture?. As of now, the left switch in my wall turns on and off the light in my fan. The right switch appears to do nothing. And the remote can control the fan speed. I would like the right switch to be able to turn on-off the fan, however, and then probably just put the remote away unless I want to change the fan speed (there is no chain pull on this fan). EDIT 2: Answering questions in comments: I'm not sure how the switches feed to the ceiling fan/light. I assumed that since it is a double switch that it is intended to control the light and fan separately, but I guess it's possible that the right switch controls maybe an outlet somewhere in the room. Does that make more sense given how it is wired (not home so I can't check that right now). I'm having trouble finding any wiring diagrams where there are two three-wire source cables for anything. As far as the ceiling goes, other than the wires from the fan and remote, there are just the four wires in the box from the source (black, red, white, green), but I'm not sure where they come from. They must be tied to the left switch at least in some way because that one can turn on/off the light in the fan. Why would the two switches have a black pigtail connecting them if they fed unrelated fixtures (like the ceiling fan on the left and an outlet on the right)? Would there be a good reason to connect all of the black wires otherwise? EDIT 3: The switches are in the same box on the wall in the bedroom. I thought the same thing about one switch for fan and one for light. The fan I replaced did not have a light, though, and the previous owners left it running because the switches on the wall couldn't turn it off (I turned it off with its pull chain). That's one of many reasons I'm not convinced the switches are wired correctly. The black and red wires do come out of the ceiling box (and I have them wired to fan/light separately). But I'm confused why both of the wires coming into the wall box with the switches would have a red power line. I expected one to have the power source (black, white, ground) and the other to have the black, red, white, ground wires that goes up to the ceiling. But having a red and black in and a red and black out is confusing to me. If you compare to something like the first diagram here: http://www.do-it-yourself-help.com/wiring_diagram_ceilingfan.html. You would have a black line in to the box, which you connect to the top screw on both switches with pigtails, etc., and then the bottom screw on one switch can send black out and the bottom screw on the other switch can send red out (powering the light and fan separately with a simple break in hot for each. What I don't get is why there is a red power line in inside the box, and since there is a red and black in, why the switches wouldn't be wired as red in on top, red out on bottom for switch 1, and black in on top and black out on bottom for switch two (with all neutrals connected together and grounds connected together). The mixing and matching of red and black is throwing me. P.S. Sorry for all of the edits, I can't respond in comments because I am a new user to the site. The wiring was as the commenters suggested (one switch going to the light/fan and one switch for an outlet in the room). I hired an electrician to come change it so one switch works the fan and one works the light on the fan. Are the switches next to each other or in different parts of the room? I suspect this is a 2 load, single pole configuration where one switch drives the fan and the other drives the light. In this case, black and red in the ceiling represent light and fan loads respectively with shared ground and neutral, but it's hard to tell as it isn't clear what is coming out of each box. The main part that doesn't make sense is the red coming out of both as load since you don't describe those ending up in the ceiling box. Figuring out what the load wires are is going to be pretty key. Not the answer you're looking for? Browse other questions tagged electrical wiring switch ceiling-fan or ask your own question. How should I wire a ceiling fan remote where two switches are used to control the fixture? Ceiling Fan Universal Remote Wall Switch Install… Which wires? Is it common, or even correct, for both wall switches in a double gang box to provide power to a ceiling fan/light fixture?